New Week’s Resolution . . . . .
January is never a great month is it? 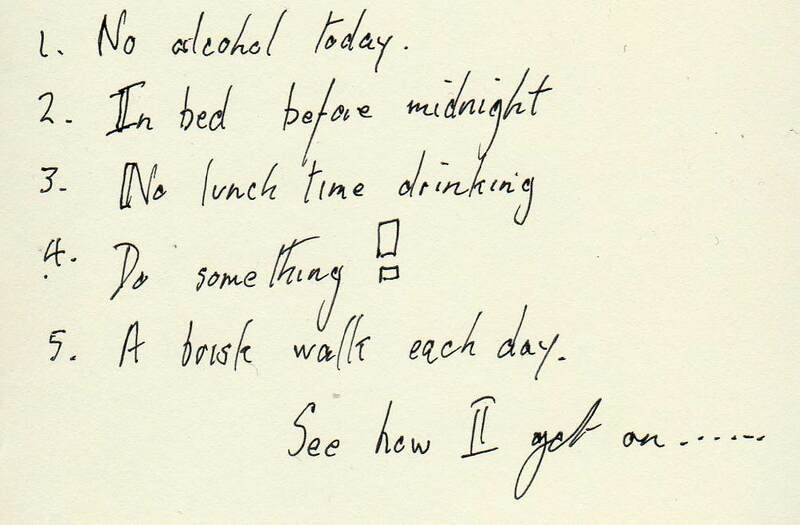 So I decided to try a New Week’s resolution– I reckon that might get done – – no point in being too ambitious. . .
See? I’ve made it public – my level of commitment is there for all to see . . or not. 1. Only a quartino of wine with dinner at 8.30- late start small quantity . . . . . and anyway in certain parts of Italy it’s illegal to not drink with a meal….. no.. I just made that up . .
4. Did something: went to the dentist, took Archie to the vet and also spent about 4 hours cleaning the studio. 5. Managed a swift lap of the village – only twenty minutes but flat out and it’s bloody freezing. Still (life) in the pizzeria . . . a recurring theme . . . 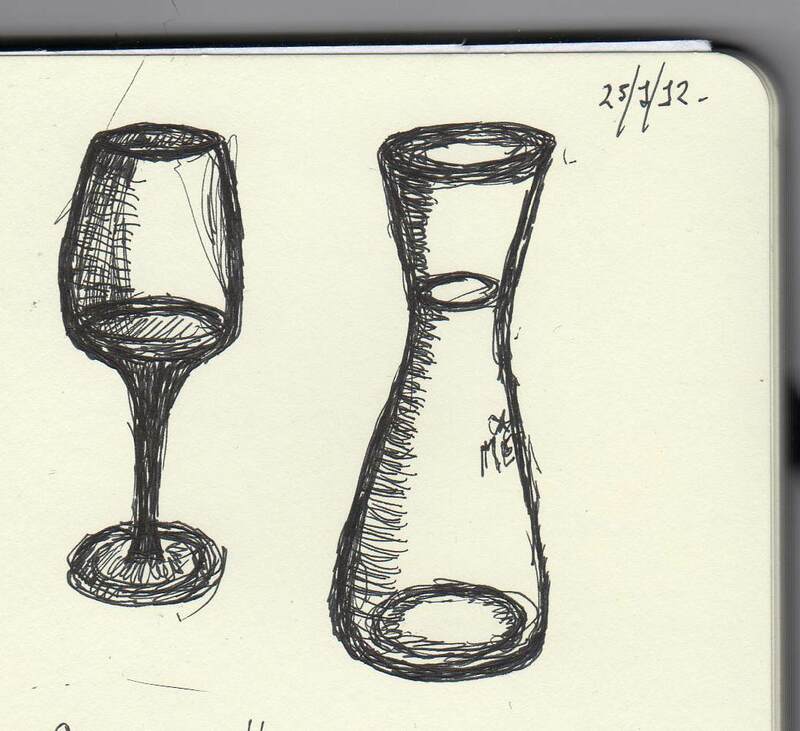 I think I drew my first wine glass in 2004 – I drank from my first wine glass some considerable time earlier . . . I think the density of the black works really well on the creamy Moleskine paper. The pen is a Pilot G-TEC-C4 with 0.4 point. Still (life) in the pizzeria . . . Strange that I’ve gone back to using the pen I used in my first Moleskines -over 8 years ago! 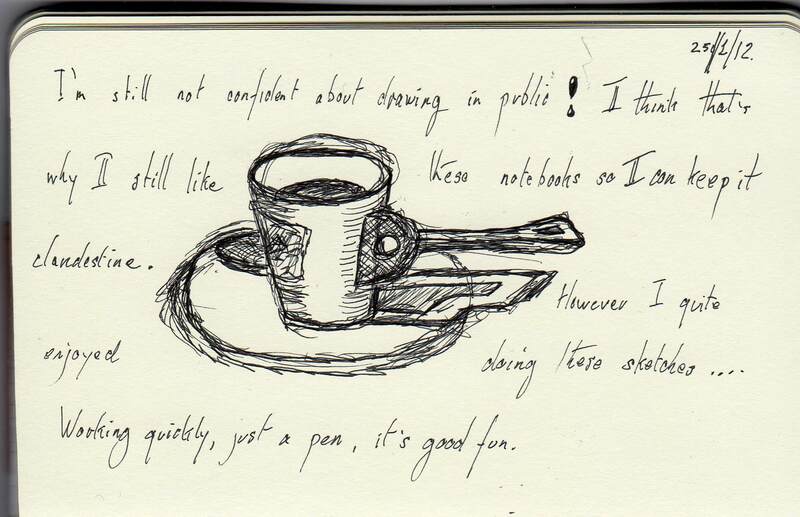 It’s very versatile- good for writing and drawing and the density of the black works on the creamy Moleskine paper. 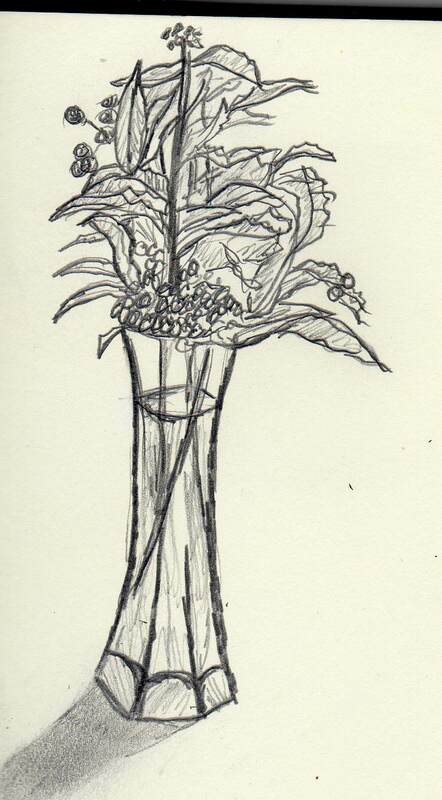 Still life in the pizzeria… only me . . .
Nonna Betta- exploring the ghetto. 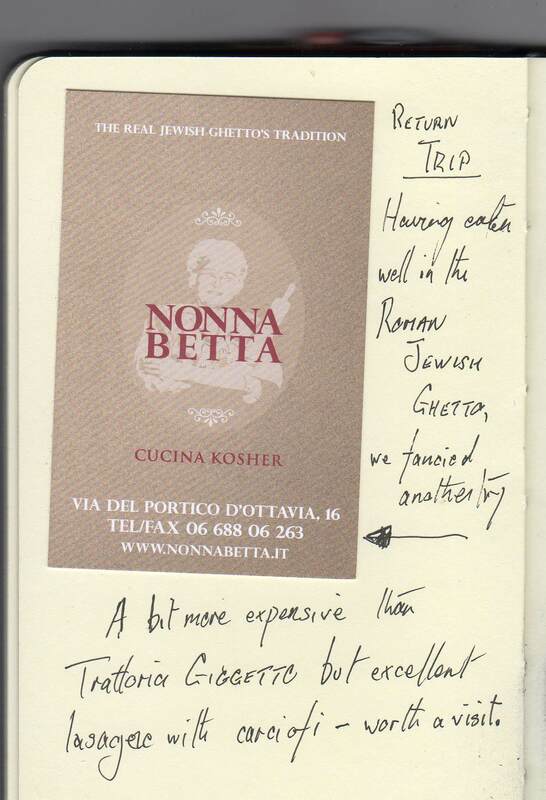 Jewish Italian cuisine- can you imagine the combination of two cultures more likely to produce excellent food? To be recommended. 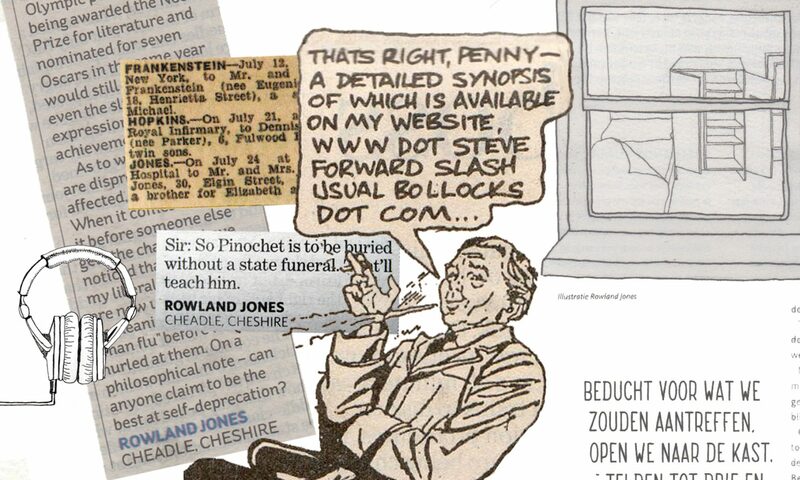 The Kafka-esque pain that is ‘virtual castration’ . . . . I experienced a strange emotion in the last 24 hours— virtual castration . . .
First the mail forwarding on this blog ceased working. I checked the registering company’s FAQ’s and contacted their support desk and they replied reasonably quickly. I did as they suggested then : the good news . . .and the bad news. Web forwarding not working so I am informed by technically competent friend—- doesn’t work in Explorer or Google Chrome. I sent message to WP support. I checked it on Safari and Firefox – seesm ok; empty cache and still seems OK. This morning NOTHING AT ALL!!!! AAAAARGGGH! So I had to go out but after lunch I reset everything as far as I could make out . . . . and it all seems to be working again . . . . But the severity of panic was more frightening than the problem – – cut off from the ‘virtual world’ . . . I must get out more . . . .